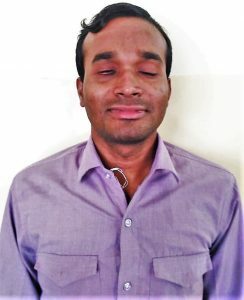 A resident of Kanpur, Uttar Pradesh, 25 year old Jitendra Singh is blind by birth in one eye. He went to a mainstream school and led a normal life, socialising with friends and engaging in outdoor activities. But in 2008 he met with an accident which injured his other eye as well. He underwent an operation immediately and eyesight in the left eye was restored. However a year later, receiving treatment for Malaria, the doctor prescribed Jitendra with an unusually high dosage of medicine which resulted in degenerating vision. This time he was taken to Sankara Nethralaya in Chennai where his left eye was operated again. But unfortunately Jitendra was left with minimal vision. Without knowing anything about life with blindness, he continued his schooling merely on his will. With his deteriorating vision, he gave his 10th board exam, continued to his higher secondary but by then it became too strenuous given his limited vision. He couldn’t clear the 12th exam at the first attempt. Having no knowledge about scribe and accessible study material also added to his challenges. This left him grief-stricken and searching for support. The relentless search helped him find out about Eyeway from our radio programme ‘Eyeway yeh hai roshni ka karwan’. Through the radio programme, Jitendra learnt of scribe facility for visually impaired people to help them write exams. In 2013, he enrolled again into 12th standard and cleared the exam with the help of a scribe. After that he went on to successfully complete his graduation and all this while he kept close contact with Eyeway. Since then and more recently Jitendra has called the Eyeway Helpdesk to find out about various schemes and opportunities for persons with visual impairment. He has sought guidelines for banking, issuance of Disability Certificate and UDID card, eligibility for different jobs, computer training courses and so on.